Available in three sizes, ranging from 5' to 7', our Poly Oval Mission Dining Table can be tailored to fit any outdoor dining space with ease. 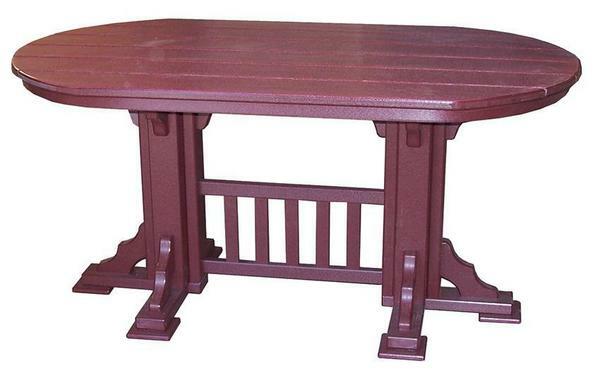 Crafted by hand with a trestle style base and large top, this table has the same look as a popular dining room table, but is made from eco-friendly poly lumber to ensure a useful life outdoors. Paired with our Poly Dining Chairs, this table is perfect for hosting barbecues or get-togethers at any time. The spacious top ensures you have room for food, drinks, and all the sides while offering your guests plenty of elbow room to dig in. Serving double-duty, this table will also make a great buffet table during larger parties, where guests can help themselves to food or drinks - with plenty of room for your entire spread. Choose from an array of vibrant, fade-resistant poly colors to accent your home or outdoor decor.